Considering the recurrence of the fish iconography in Jewish tombs and burial artifacts, it can be stated that it had a symbolic meaning for the Jews of the period, and was adopted by the Christians. In the Hellenistic and Roman times, there was a certain tendency to relate fish or fish-like images to immortality. Thanks so very much for this Antonio. There is much to discuss and you have provided us with some fascinating new materials, some of which I was not aware and want to look at further. I did want you to know that Simcha and I spent a very delightful day with Paul Figueras at Bet Shemesh last year and we talked in depth about his own work, how he had begun, and his long history of living in the Holy Land. One thing he told us, and I went ahead and put it in the book, is that initially, when he found the Yeshua fragment inside what he thought to be a fish, he was indeed convinced and extremely excited that he had chanced, in the basement bin of the Rockefeller, the first and earliest evidence related to the Judeao-Christians. As time went on, and he found that he was distancing himself more and more from Testa especially , and even Bagatti (he had come to study with Testa originally), he found reason to distance himself from that initial thesis he had held, though he remains convinced it is a fish, not merely a circle. More later on some of your other points. James, a curiosity? Did you ask Figueras about this ossuary? This is the type of well researched contribution that I was expecting, thank you very much, you are especially answering my initial questions to James Tabor in my comment #29 to his article posted on this site : A Preliminary Report on a 1st Century Tomb. We can at last consider this debate scientifically opened now. My attitude had always been, since my first article published in 1991 on The Jewish Funerary Customs in Roman Palestine, to link the practice of ossilegium to the belief in the individual bodily resurrection/revivification, a concept widely attested among at least the Pharisees in Roman Palestine. Your article is mentionning floral, fruits and animal decorations on various Jewish and Judeo-christian ossuaries. In my judgement it can only add evidence to the link with resurrection in these burial pratices, since there are discussions in the rabbinic literature about resurrection described as a phenomenon inscribed in the revival of the nature. See Babli Sanhedrin 90b, among others, referring to Isaiah 66, 14 : "Your bones will reflorish like the grass". Moreover Rabbi Eliezer and Rabbi Gamaliel II at the end of the first century refer clearly to the initial creation of the world when discussing resurrection therefore the concept is perceived at least by a certain group as a world creation "de nouveau" including nature and animals. Hence this type of decorations on ossuaries. I should find especially interesting if at least the debate that Tabor and Jacobovici have opened would bring scholars to a concensus on the link between ossilegium and resurrection in early roman Palestine. Antonio, just a few point in response to your posting here. 1. I appreciate your additional examples of possible and probably fish on ossuaries in various private collections as noted in Figueras, Testa, et al. It is difficult to know how to interpret some of them, and several might indeed be fish, and it would be helpful to see photos of the ossuaries themselves and examine them directly so one could understand more about any known provenance and possible context on the ossuaries themselves. I have not been able to do this and we had limited our autopsies to ossuaries and fragments found in Bet Shemesh, the basement of the Rockefeller, and the basement of the Israel Museum--in other words those in Rahmani plus some more recent finds. We also focused on tombs in Herodian period Jerusalem, not other places and centuries. I asked Shimon Gibson, who tends to be pretty encyclopedic on such matters, about fish in general as images in Jerusalem in this period and he named of course the well known stone table edge relief that Avigad published from the Jewish Quarter and also a fish image on a bowl I have not seen found in the Mt Zion Broshi excavations. Shimon is not convinced the oft cited Claudius example is a fish and as you know I have my doubts as well. 2. I am still more impressed with the extreme rareness of any possible fish images. As for other animate images, as anyone looking at Rahmani would know, it remains the case that motifs of animals or human figures on ossuaries are extremely rare, most likely due to the prohibition against graven images, so I need to so qualify my general statement. Rahmani notes that even amphora are quite rare, comparatively speaking, which he attributes to their association with cremation in contemporary Greco-Roman culture and the tendency for to accordingly eschew them. 3. As to whether we can conclude that these very few scattered examples of fish, or possible fish, of Herodian Jerusalem provenance, express hope for afterlife I think is a difficult call. I am in general agreement with you, contra Rahamni, that ossuary decorations, though often standardized, likely express hopes related to death and afterlife. If Testa went too far one way, I think Rahmani and others have gone to far the other way. On the symbolism of fish in Judaism more generally, I think Goodenough's discussion (vol. 5, chapter 2) is most helpful, as well as Ross Kraemer's delightful article "Jewish Tuna and Christian Fish" in HTR. 4. As for you analysis of our image as some kind of vase, perfume bottle, or amphora, I simply don't agree, as I have discussed on my blog, see my latest post here: http://jamestabor.com/2012/03/27/its-a-bird-its-a-plane-its-its-anything-but-a-fish/ where I offer some general observations. I am glad to see the recent blogger discussion move from the "tower"/nephesh to the vase, but the fact is this image fits none of these and I think even the vases and flasks pictures are from a different period, i.e., cf. Herodian Jerusalem unguent aria, etc. The "handles" you reproduce, as marked by Cargill, are simply not there as he traces them, in fact the long vertical line is the clear edge of the ossuary border, and the stray line at the top edge of the "tail" is not even connected. The "head" of the fish image simply does not fit the base of a vase, even when "flattened" by photoshop. We have fairly good, even close up images of the head and stick-figure and it is proportionally and otherwise not the base of a vase. The simple fact is no one could take any of our images of amphora on ossuaries, or nephesh for that matter, and even remotely argue "its a fish, its a Jonah image." Whatever this image is there is no parallel on any ossuary or in any other example of Jewish art from this early period. James, I agree with you on 3 points. Vase-like iconography and fish graffiti on ossuaries are very rare. However, despite this rareness, looking at the remaining depictions on Jewish ossuaries and tombs, I'm inclined to include your "Jonah" ossuary among the vase-like iconography. Fishes were much more simply engraved. I might also agree with you that there is no parallel on any ossuary for that image. Well, but we have to compare it with those archaeologists have unearthed. And in that comparison it is more likely to be an "unparalleled vase" than an "unparalleled fish". BTW: did you ask Figueras? No, we did not show it to him but I expect we will now that everything has gone public. Have you ever met him? He is a dear and wonderful soul, very knowledgable and gracious with a long history of following these fascinating studies from the days of Testa, et al. He has those wonderful stories that unfortunately are several written down. I am wondering what vase you have in mind that archaeologists have uncovered--in other words, from where and what period? The ones you show in your article and that have been posted elsewhere, and correct me is I am wrong, seem far removed in time and place from this provenance. I am pleased to hear though, that you as well as others it seems, are clear that this particular "vase" (sic) fish :-) is unprecedented. I think that is progress over "it is just a tower," or "it is just an amphora," we have dozens of those, no big deal. I think if you concentrate on the bottom of the figure, in the raw photos themselves, with the head and other markings, the fish/Jonah hypothesis becomes clear. Antonio Lombatti has penned an excellent article. Kudos to Antonio for writing it, and to Bible and Interpretation for publishing it. Please look at Plate 30 on page 12 of the article. Specifically, look closely at the graffito handles on both sides of Figs. 356, 24, 84, 86, and 90. There are symmetrical handles on both sides on the top. The figs. in Lombotti's article also each have handles on the top, and some are even 'unattached' at their bottoms. Figure 90 even has two sets of handles (top and body), just like the image on Ossuary 6. Figs 24 and 86 have the "ball" base at the bottom. 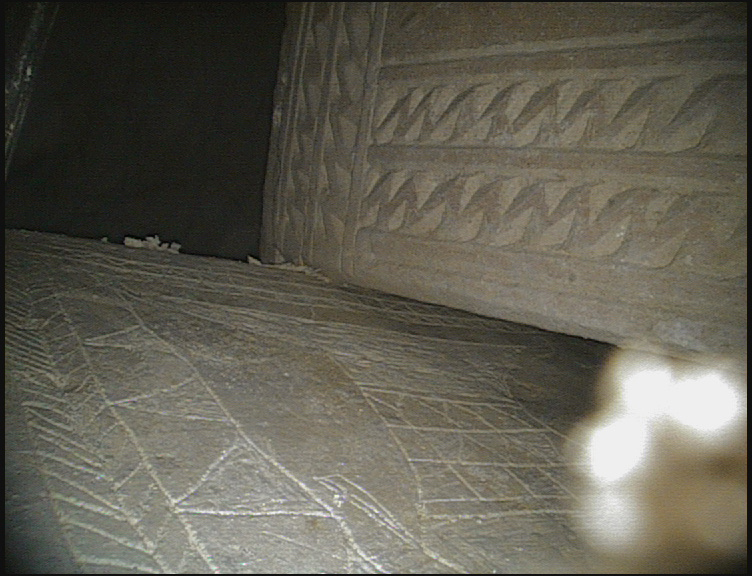 There should no longer be any doubt after Antonio Lombatti's article that what we are looking at on Ossuary 6 is a graffito of a vessel, and not a fish. Claude, I could not agree with you more. I find the minimalism of Rahmani, Taylor, et al. to be overdone when it comes to arguing that there is no symbolism involving "life after death" on ossuaries of this time and place. If Testa was too extreme, and Goodenough too much of a speculative "maximalist," the other position that nothing every means anything seems to me to be extreme. When we have something like what we take to be the Jonah/fish image on this ossuary, or any other features on ossuaries that are not ordered off the shelf from the proverbial "ossuary shop," they seem obvious to me to be expressions of individual hope and faith on some level. And I would even say, even some of the common ossuary motifs that might be ordered at the "shop," had their origins at least in some desire to express ideas. I don't know your article and want to go and look it up. My friend James Tabor is a good man. He sees the good in people. Lombatti accuses us of “digital manipulation” as “proven by Cargill” and he finds him gracious and engages him in civil conversation. Lombatti is blowing smoke. Of course there are other fish images, we’ve said so for years. And each time someone found a fish, the experts screamed a circle. Look at CIIP – they don’t acknowledge a single fish! But along comes Lombatti – it’s actually funny – and he sees fish everywhere except on our ossuary. Why? Because he’s in a panic. Simply put, if this is Jonah, that’s Jesus. So it can’t be Jonah. First it’s a pillar, then it’s an amphora, then it’s a perfume bottle - “unguentaria” for the initiated – then, by golly, it’s a vase. Just a lousy vase. Everybody has been talking for a month about a crummy vase. But if it’s just a vase, why is everyone talking about it? Why has it made the front pages, including Israel’s leading newspaper, with compliments from the IAA? Well, those dastardly people stooped to “digital manipulation”. Luckily for the small group of naysayers, Cargill turns out to be a graphic and digital expert. He exposed the manipulation and presto; you’ve got a simple, lousy vase, just like those other lousy vases...not! The fact is that our lousy vase doesn’t look like the other lousy vases, it looks like a fish. So what do you do? Lombatti is brilliant; the only way to prove that ours is not a fish is by fishifying all the previous images that they previously called circles. So we’ve gone from no fish to dozens of fish. More than this, every scratch is a bird. Those first century Jews were actually graffiti fanatics. They were scratching humans, birds and fish on everything, especially their ossuaries – except for ours. That’s the one ossuary those graffiti artists of old missed. You see, by making everything a fish, we can compare ours to theirs and ours is lacking. You upgrade the circles and downgrade our fish. The circles become fish, the Jonah disappears, and our fish becomes a lousy vase. But there’s a problem with that strategy – the problem is that you suddenly identify fish where previously there were none, and that’s a whole new kettle of fish. This is actually very, very good for our hypothesis. What is Lombatti going to do with all those fish? First, some experts will say that all Jews drew fish all day because they were into resurrection. But that argument is going to fail miserably. To be certain, those fish carvers were Jews, but they were not mainstream Jews. So suddenly Lombatti is going to end up with a lot of Christian ossuaries where before we had none. And you know what? I agree with Lombatti. There are a lot of fish out there. They are not circles. They are Judeo-Christians. Bagatti was right. The entire movement is overly represented in the ossuary community because they were “minim” i.e., sectarians. Morton Smith was right. They drew pictures when the others didn’t, they called Jesus by the Tetragrammaton which the others saw as heresy, they were buried in ossuaries and, basically, they started a new religion (wait a minute, didn’t Caiaphas accuse Jesus of heresy?) Lombatti is good for The Jesus Discovery thesis. He’s digging himself a hole. The funny thing is he doesn’t realize it yet. I think for the naysayers Joan Taylor’s argument was a better way to go. I think they should have stuck to the perfume bottle. That argument had a better smell to it. Talking about digital manipulation. My older son, who lives in Vienna, just sent me a newspaper story from one of the major papers there on our new discoveries--full page spread. Yes, the fish is there, as a fish, but guess what--there is this really attractive photo of ME, not Simcha, at our NY press conference last month, holding forth, right in front of the ossuaries--but it is captioned Simcha Jacobovici! As if he has now become my avatar. I can't decide if I am him or he is me and what might be going on here in terms of identity theft, as it could go either way. Even if you photoshopped me in that photo, made me thicker and put a yarmulke on me, I still don't think it would pass so people are going to realize it is not really Simcha but me and we will have one more accusation of manipulation, falsification, and mistaken identity. Much more serious than mixing up a fish and a vase in my book. Dr. Tabor is a good man, so much so, that even those criticizing his theories treat him with respect and even humor. But Mr. Jacobovici, with his caustic sarcasm and his attempted puns and constant one-liners, arguing 'strategies' with anecdotes instead of interpretative theories and solutions with facts and evidence...well, I'm guessing there's a reason scholars look at Mr. Jacobovici far differently than Dr. Tabor, and respond to him accordingly. Let's be clear: fish don't have handles, and these 'fish' have handles. The so-called 'Jonah Fish' has handles on *both* sides, in the *same* shape, and the *same* size, and the *same* place, on the side *and* at the top. The so-called 'Half-fish' has handles. And the 'Fish in the margins' were digitally inked, until I pointed it out (http://wp.me/pm5VN-2lz), at which point they quickly pulled it from the website (formerly Img. 16) and re-uploaded it as Img. 61, now labeling it as 'marked', and then uploaded the 'uninked' image, which only demonstrated all the more clearly that the 'digital ink' did *not* match the inscribed areas, but instead overlapped to make the images *look like* fishes, when in reality, the inscribed markings clearly don't overlap. Dr. Tabor's research on the background of fish iconography, resurrection, and the 'Sign of Jonah' are to be commended. They are the strengths of the book. There are small problems here and there, but nothing more than the typical scholarly back-and-forth correctives that take place. And to his credit, we should note that Dr. Tabor has acknowledged, conceded, and at times taken measures to remedy some of these scholarly suggestions. In fact, his graciousness and professional humility should be applauded for that. But taking some screen grabs from some distorted images, manipulating them digitally, then offering anecdotes and sarcasm and calling it archaeology is much different. And please note the distinction between the IAA giving its 'blessing' and issuing a 'license'. Drs. Tabor and Arav received a 'license' (note, Mr. Jacobovici's name does not appear on the license, cf. pg. 58, Fig 14 of 'The Jesus Discovery'), meaning Mr. Jacobovici and his team weren't excavating illegally. But I doubt the IAA has given Mr. Jacobovici its 'blessing', as the only mention of 'Jacobovici' I can find on the IAA's website (http://www.antiquities.org.il/search_eng.asp?image1.x=0&image1.y=0&q=jacobovici) is a press release *refuting* some sensational claim he made. It's not what I'd call a ringing endorsement of Mr. Jacobovici's past archaeological work. P.S. : Did you drop a "…not!" in your response to Antonio?? What is this, the 90s? I thought I was watching a re-run of 'The Fresh Prince of Bel-Air' for a second. Really?? A '...not!' ??? lol. Well, I really don't know what to say, probably because it's hard for me to get the Jacobovici's irony and sarcasm. As for my paper, I have compared known fish and fish-like iconography on ossuaries and in tombs with the "Jonah" image and I wouldn't include it in this category. That's all. But if you are able to find more examples of ancient fish graffiti that I may have missed and prove that your "Jonah" picture looks like them, I could also change my mind. I have spent quite a few hours today looking at your "handles" on the fish image. They are simply not there. I think on the left side, the lines, which are not connected to the image, most likely represent a false start by the engraver, where he saw he had not positioned his image/tail the way she wanted so he moved it. As for the little blurbs you keep highlighting, on the left and right tips of the tail, there is nothing there. Nothing. I guess we will have to sit over a few beers sometime, and it might have to wait until Chicago, with a stack of HiRes images, and both of us with certificates from our opthomologists, not a lousy optometrist, showing we CAN see clearly, and settle this man to man. 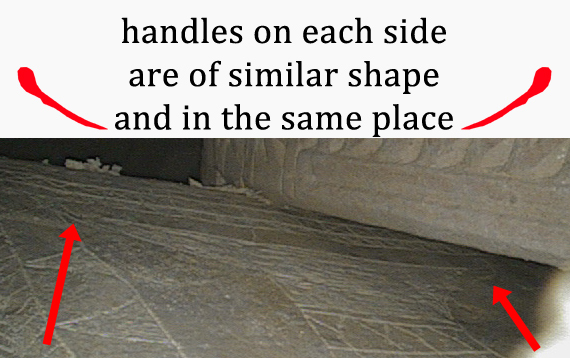 On the image on the end, again, the right side is a sharp angle, 45 degrees, but not connected at all to the "vase" you, and the left has a very curved scratch, not sure if it is connected, but together they can not be a pair of handles. Again, the two "blurbs" you highlight are just not there. Again, contrary to your charges, NOTHING has ever been pulled from our web site in response to you though a lot has been added and some incorrect captions have been corrected with thanks to Mark G. as I recall. Mark 1: 16-20 "As Jesus walked beside the Sea of Galilee, he saw Simon and his brother Andrew casting a net into the lake, for they were fisherman. 'Come, follow me,' Jesus said, 'and I will make you fisher of men.' At once they left their nets and followed him." I've found out only in these days, that one of the archaeologists who entered the tomb in 1981 wrote a report on Davar: he described the image on the ossuary as אגרטל. "Considering the recurrence of the fish iconography in Jewish tombs and burial artifacts, it can be stated that it had a symbolic meaning for the Jews of the period, and was adopted by the Christians. In the Hellenistic and Roman times, there was a certain tendency to relate fish or fish-like images to immortality. It might have been an eschatological fish, so what was its purpose on ossuaries and in tombs? The flesh of the Leviathan was intended to feed the righteous in the final banquet. Therefore, the fish represented a graphic expression of the desired immortality for the deceased. This iconography was not an invocation, as in later Christian imagery, but an evocation of a future happy life, immortality, and the coming resurrection, which was described in the Jewish literature of the period. That said, I have little doubt that the name ישוע inside that fish-like graffito recalls the hope for the saving of the deceased soul." "Johannan Ben Zakkai, in the second half of the first century, affirms: Rabbah said in the name of R. Johanan: The Holy One, blessed be He, will in time to come make a banquet for the righteous from the flesh of Leviathan; for it is said: Companions will make a banquet of it. [...] Rabbah in the name of R. Johanan further stated: The Holy One, blessed be He, will in time to come make a tabernacle for the righteous from the skin of Leviathan; for it is said: Canst thou fill tabernacles with his skin. If a man is worthy, a tabernacle is made for him". True, R. Yohannan Ben Zakkai survived the horrors of the Roman siege on Jerusalem and later flourished during the second half of the 1st century CE. Yet the R. Yohannan in Lombatti's source, B. Talmud, Bava Batra 75a, is simply not R. Yohannan Ben Zakkai, but R. Yohannan, the founder and leader of the Tiberian rabbinic academy, who flourished ca. 235-279 CE. The Babylonian Rabbi who quotes R. Yohannan in Lombatti's source is Rabbah, the head of the rabbinic academy in Pumbedita. He was younger than R. Yohannan of Tiberias, and flourished ca. 270-310 CE. No doubt, Palestinian and Babylonian rabbis have been acquainted, to different degrees, with Judeo-Christians and Christians in general, in the time of R. Yohannan of Tiberias and later. We do have written evidence that Palestinian and Babylonian rabbis had to cope with these people and the problems connected to them. However, Lombatti states: "Considering the recurrence of the fish iconography in Jewish tombs and burial artifacts, it can be stated that it had a symbolic meaning for the Jews of the period, and was adopted by the Christians". Regarding this statement, one point is clear: R. Yohannan Ben Zakkai lived relatively short time after Jesus' death; but we may seriously doubt the possibility that Leviathan can be related to death, burial and afterlife among normative Jews in his time. This enormous marine mammal does not appear in the earliest rabbinic source, the Mishna, at all. It is mentioned in the source that follows the Mishna chronologically, the Tosefta, only once in tractate Hullin 3:27; here the Leviathan is depicted physically as having scales, but not in any funerary circumstances. Not surprisingly, then, the Leviathan is not mentioned in the Jerusalem Talmud at all. Thus we may firmly state: even if Second Temple Era Jews had a slight idea of what a Leviathan is, we don't have any written evidence from Palestine that Leviathan is connected, one way or another, to funerary circumstances. The resulting conclusion is that when Leviathan is under discussion, Christians and Judeo-Christians could not adopt its symbolic meaning from Jews. Lombatti correctly states: "The flesh of the Leviathan was intended to feed the righteous in the final banquet". But in the following line he makes a generalization: "Therefore, the fish represented a graphic expression of the desired immortality for the deceased . . . but an evocation of a future happy life, immortality, and the coming resurrection, which was described in the Jewish literature of the period".The flesh of the Leviathan was intended to feed the righteous indeed – but ONLY the righteous; thus it's not symbolizing the resurrection of the righteous, nor does it symbolize the general resurrection. For most, it symbolizes the reward the righteous are entitled to for being what they are – righteous. These rabbinic sources speak of the special future "dish" for the righteous, while not relating to any sort of resurrection, whether general or specific. One may suggest that these sources imply the righteous' afterlife, but the sources do not speak of any "final banquet"; they depict the future "dish", to be made of Leviathan's flesh and the future tabernacle, to be made of Leviathan's skin, both meant only for the righteous. After all, the Jewish literature of the period, meaning the 1st century CE, does not explicitly connect Leviathan to resurrection; this is the case even with the later Jewish literature: the Mishna, the Tosefta, and the Jerusalem Talmud. Therefore, we may ask: who were those Jews, from which the Christians adopted those concepts? We also have to bear in mind that figurative art was prohibited to Jews until mid 3rd century CE, when R. Yohannan of Tiberias permitted wall painting. Geometric forms of flowers and rosettes have not been considered figurative ornamentation before R. Yohannan's permission – thus Jews could use them on ossuaries etc. Connecting the Beit Shearim finds to the Second Temple Era seems equally problematic; this site became a necropolis only in mid 3rd century CE, and attracted also diasporan Jews. Some of them ordered their ossuaries\sarcophagi or niches walls to be painted and ornamented as a result of foreign influence. In any rate, this phenomenon is much later than the Second Temple Era. On the contrary, as Jews and Judeo-Christians lived side by side in Palestine and around it, it seems more likely that Jews adopted their neighbors' customs than the other way around, and that if this was the case, it occurred much later than the Second Temple Era, in terms of normative Jews. Lombatti presents other occurrences of fishes as parts of Jewish-Palestinian funerary inscriptions; these finds are not dated, yet they seem to represent the results of Hellenizing processes within the Jewish society in Palestine. In other words: those Jews cannot represent normative religious Jews. This is in contrast to Lombatti's statement: "it can be stated that it had a symbolic meaning for the Jews of the period, and was adopted by the Christians". Thanks for you long and thorough comment. The goals of my paper were two: 1) show how fishes were carved on Jewish ossuaries; 2) compare these images with the amphora ossuary of Talpiot B tomb. The symbolic meaning of such carvings (birds, fishes, human figures or ships) may be disputed. For sure, it had some meaning. Considering that Jews believed in resurrection, I can state that fish on ossuaries and tombs was related to it, despite what the rabbinical sources may or may not suggest. Dear Lombatti, it seems we agree. Rabbinic sources do represent the voice of a group whithin the Jewish society. This was certainly not the voice of the Hellenized Jews. Jews did, and still do, believe in resurrection - however, not in a personal three days resurrection, but a resurrection of a general nature, that will take place on an unknown date in the future. So some Jews believed in a "short term" resurrection, since they believed they've already witnessed one. Moreover: how exactly the image of fish is connected to resurrection? Regarding Rahmani # 140, I believe one should examine the template, rather than the author's drawing of it in the text. It does look like a fish to me, with even a small mar where a (whale's) mouth would be. BTW I'm aware that Rahmani # 140 is tagged 53 , apparently indicating the date of its cataloging. But on this very delicate subject, I'm afraid everything must be taken with a grain of salt. The image of the fish is connected to resurrection because the deceased acquires a new skin - the skin of the leviathan. If the deceased is invited to the banquet then he has been judged righteous to be with that company. The act of consuming the meat allows the deceased to be transformed with a new skin (Al Hwt). The new skin must be anointed and the amphora is provided. The triangles are the fish scales that will comprise the heavenly skin of the deceased. The fish is swimming upside down because it represents a whale shark (Al Hwt) and the stars are on the backside. Whale sharks are common in the Red Sea.